In addition to that, medyo malayo yung "1" sa "7" nung 1740. And medyo payat yung mga legends at nakalutang yung globes dun sa pagitan ng pillars sa 1740 8 reales. Salamat sa posting ng coin mo Liz. Based sa dies ng 1740 8 reales at 1735 8 reales. Medyo malaki ang pagkakaiba ng 1735 at 1740. Usually mapapansin nyo yung difference ng "dies" sa "dot" sa ibabaw ng letter "M" sa assayer's initial at sa porma ng "F" sa assayers initial pa rin. Tama naman yung die ng 1740 8 reales ni Liz. Maganda rin ang condition nung coin. I take a risk everytime i purchase one, i always assume that its a fake instead of assuming that its authentic, that's why everytime i show it to the experts, i feel so much joy finding out that my coins are actually authentic! No problem. Later I'll post mga infos about counterstamp coins para additional reference para sa mga gustong mag collect ng YII and F70 counterstamp coins. Sure, sige i-post mo lang para makita natin. Ano ba yung counterstamp nya? Yung George III na octagonal o yung oval counterstamp? sure eric! i do have the pics problem is i dont know how to post them here... maybe i will just upload it in my multiply and attach the link here..
if you upload to your multiply, i can try to post them here. This is an 8 reales with "Crowned arms of Portugal" counterstamp and is listed in Krause Coin Catalog as KM 440.8 and priced USD 500+ in VF. However, this coin is special considering that the host coin is quite rare and a key date in the Dos Mondos coinage so the catalog value of the coin does not follow. This is one of the most copied coin by modern counterfeiters due to its rarity and fame in the collecting community. thanks for posting it ericgo. Im going to bring these coins soon to my mentors.. It seem that both these coins came from one seller and I have the suspicion that these are modern day Chinese counterfeits. The "die" for 1745 8 reales seem authentic but if both were sold to you side by side. Both of these coins are modern day counterfeits. The 1739 8 reales die is not correct because the globes on the middle of the pillars are not right, the position of the numbers on the date are not also correct, and the letters on the legends are too thin. I suspect that these coins came from an ebay.ph seller from Visayas which is actually a Chinese counterfeit ring operating in the Philippines. If you could post the edge of the coins, that would be better. The edge should be like that of tulip flower and not a trident pattern. It should have no gaps in between. 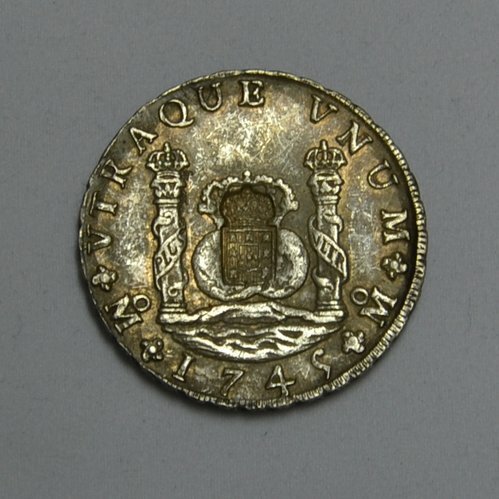 Here is an authentic 1739 8 reales for comparison. looking at those 2 coins, i wouldn't know if they were authentic or real. But after what sir FN posted, it would be interesting if the 2 local dealers certified these coins as authentic. 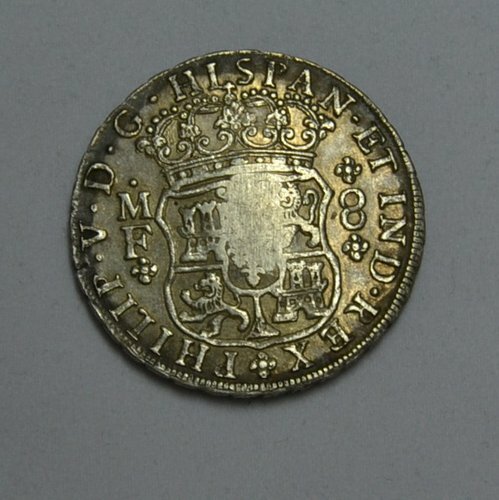 If you'll scrutinize the 2 recent coins, unlike that of Liz's 1740 8 reales both of the recent coins seem to be cast and not struck. The clue is on the coin's legends, the letters are not well-formed although the coin is in excellent condition. I already encountered these kind of coins before, and they are very well made copies of dos mondos. For a neophyte in dos mondos coinage, you will not notice the difference because these coins are also made of silver, the weight is the same as an original dos mondos, and the dies are almost the same. The difference are noticeable only at the rim or edge of the coin and at the collar of the coin. Modern day counterfeits are thicker and have trident pattern edge or rim and the letters on the legends are not well-formed. Most local dealers here in the Philippines are not yet updated regarding this modern day dos mondos because these coins just surfaced recently and most of the sellers are from the Philippines. Most of these sellers sell russian catherine rouble, swiss thalers, dos mondos with portugal counterstamp, spain 4 reales with george III oval countermark, rare ferdin VII and Carolus III 8 reales, and dos mondos 8 reales. Only a number of private collector have such inventories or collection so it is odd to see a seller have these same set of coins being sold weekly. Thanks again at ingat kayo sa pamimili ng coins. Thank you for the information about these coins. i've talked to another collector just last week and he also told me that there are a lot of counterfeit coins coming from china that are of very good quality. Magkano kaya ang mga pekeng yan...gusto kong i-add sa collection ko. Magandang study material yan para i-educate yung mga noobs. Actually, natural experience lang sa bawat collector yan. Ako rin, I purchased fake coins when I started to get serious with collecting coins. Medyo frustrating but that will surely give you a lesson. It is what we call tuition fees. Subject: Re: Dos Mundos/ 8 Reales Columnario real/fake?